Here's my newest kit, which you can find HERE, HERE or HERE! This tagger size kit has 15 textured papers and 90 elements. Not for the faint of heart! Great for all your halloween needs! 4 flowers, 7 plants/leaves, 4 bows/ribbons, skeltons, pumpkins, zombies, ghosts, demons, 6 frames, bats, ravens, a wolf, a black cat, an owl, a rat, 4 different kinds of spiders, brains, blood, weapons, potions, 4 candles, and a complete haunted house scene! The wordart I used for the title of this kit- the "CURSED" is your personal use freebie today! Just click HERE to download a copy for yourself. Read the TOU in the download, and direct others here to my blog post if they'd like a copy too! Thank you so much for this post. 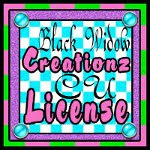 I want to let you know that I posted a link to your blog in CBH Digital Scrapbooking Freebies (please, notice the new url for my blog), under the Page 1 post on Sep. 16, 2012. Thanks again.